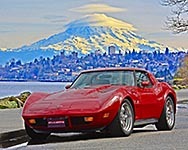 I read the fine print of this this "Corvette Dream Giveaway" with the two Corvettes and inquired on it. When I bought a ticket in 2014 I didn't read the fine print.... this time I did and I inquired on something that bothered me, highlighted below. This was their response. I do see a donation back in 2014 however I do not see an account which means you would have registered. Keeping the credit card info is for you the check out quicker but we do not keep it in our system. But again since you did not create an account that is not even on there. Yes for sharing the only thing that would have been shared is your name, address, phone number and email address. I can opt you out of all our emails and mailings if you would like me to. I'll never do one of those again! I guess they're counting on people not reading the fine print. What it is you dream about not giving away your info! Yeah, what did they leave out not to share!